The crisp look of this monochromatic champagne bar is classic and a home run for any event this season. Add a pop of sparkle with silver drink toppers and balloons. The Roaring 20s were a great time of celebration and elegance, so why not bring a little more to your party? The black and gold accents, jeweled bottles, and colorful floral centerpiece pull this bar together quite nicely. Did somebody say art deco? The details on this bar will stun your guests and leave them coming back for more. The various garnishes make an extra touch everyone will love! Welcome in the new year with this light bubbly bar. The bright colors, rosy metallics, and whimsical set up are perfect for celebrating until the clock strikes midnight and well after! Moving your party outdoors? 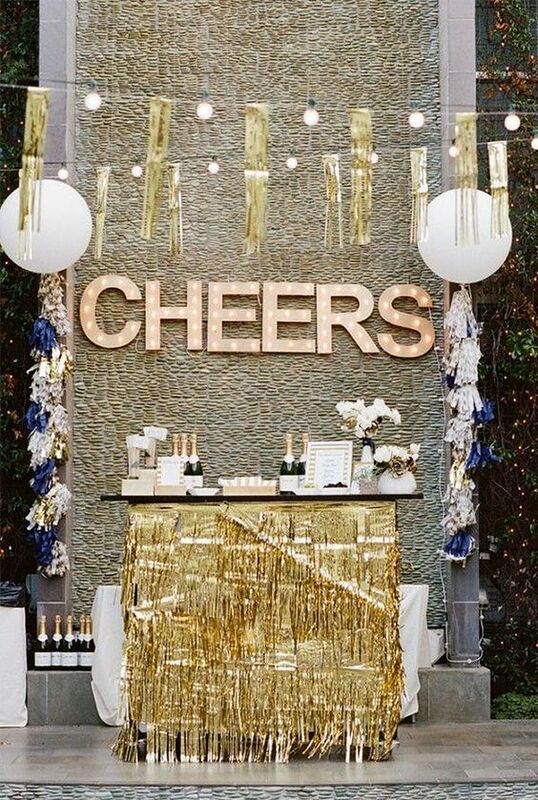 Check out this gorgeous bar, complete with gold garland, hanging lights, and beautiful marquee letters as the backdrop. Cheers! ‘Tis the season to be fancy! This opulent bar is great for an upscale gala. Nothing says ‘Pop, Fizz, Clink’ better than a champagne tower centerpiece for a large event. These have always been a crowd favorite for the holidays. Let’s pour that champagne! Mini champagne bottles are something you don’t see every day! Make your party unique with these fun-sized, personal bottles. After all, good things come in small packages. You can never go wrong with a bubbly bar complete with its own bartender. Whether your event is outside or indoors, the glam of a real, elegant bar and a professional mixologist won’t disappoint. Feeling bold this season? Look no further than a human bubbly bar. Wow your guests with servers who wear their drinks. Your event will be the talk of the town. Whatever style you choose, make your event the best it can be this holiday season!